The Papers for the 2019 AGM are now available. You can download them using the links below. For details of the AGM, please see this page. Diana has been hard at work putting together what seems like a bumper edition of the Reading Branch Newsletter. Everyting from Striking competions to Armistice rining. There also appear to have been many outings recently. Find a copy at your local tower, or download using the link below to read it now! As we approach the end of the year, thoughts turn with huge excitement to the Branch AGM! I am delighted to say that Henley have agreed to host us this year so the meeting will be held in the beautiful Chantry House, the only Grade I listed building in Henley. The meeting will be held on Saturday 9th February 2019 from 10.00 – 11.00 (coffee and biscuits available from 9.30) and will be followed by our branch practice from 11.00 – 12.30. The agenda is attached and papers will be circulated by the end of January next year. All officers will stand down at the meeting and those willing to stand again are listed below. Please send nominations for any of the posts to me. I would be most grateful if you could let me know who will be your tower correspondent for next year with contact details so that I can supply these to Heather Browning by 31st January 2019 in time for publication of the 2019 Annual Report. Would you please let me have any AOB in advance of the meeting. 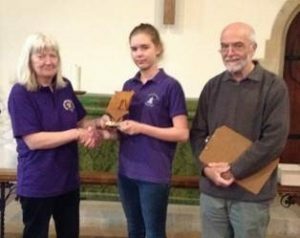 The Reading branch team won the Oxford Diocesan Guild (ODG) 10-bell competition on Saturday 24 November 2018. It took place at St Nicholas (10 bells, 21-2-1), Newbury. Four other branch teams (from a total of 15 ODG branches) took part. They were: Old North Berks (ONB) and East Berks and South Bucks (EBSB), who tied in second place, Newbury, who came fourth, and Banbury, who came fifth. The judges said that Reading had the slowest pull-off of the day but quickly settled into some very good ringing – slightly slower than the rest of the teams but very consistent and a pleasure to listen to. They rang Plain Bob and Little Bob Royal. The Reading team had representatives from four towers: Caversham, Reading (St Mary & St Laurence), Shiplake and Tilehurst. Special congratulations to Tom Sherwood, aged 15, who was ringing in the 10-bell competition for the first time. The last time Reading won, in 2016, his sister Anna was in the team. In 2017 Reading was disqualified because of a miscall – but the judges were complimentary about the ringing. 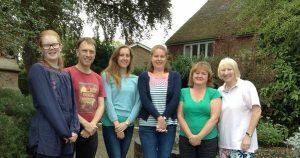 The 2018 Reading Branch Striking Competition took place at St John, Mortimer (six bells – 7-12-16), on Saturday 8th September. 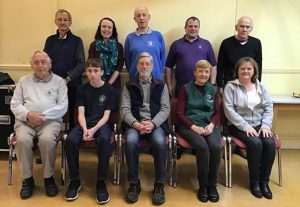 The team from St Michael, Tilehurst, came first – and therefore should represent Reading Branch at the Oxford Diocesan Guild six-bell striking competition in October. Many congratulations to the winning team! This year, only three other teams took part: Goring, who came second; Mortimer, third, and St Mary and St Laurence, fourth. Anna Sherwood, from the winning Tilehurst team, is presented with the Topper Trophy by judges Patricia and Robert Newton. Though only 18, Anna is a veteran of striking competitions, and rang for Tilehurst in 2016 and 2017. Her brother Tom, 15, rang the tenor. Bobbie May: For the first time the competition was held in the morning, at a time which would normally have been reserved for the Branch Practice. Four teams were involved but, unusually, most of the ‘big guns’ were missing, which might have had something to do with a peal that was taking place at St Laurence in Reading! The judges were Patricia and Robert Newton from High Wycombe who are no strangers to Reading Branch striking competitions. Robert explained that they marked independently from each other and didn’t compare notes until it came to the adding up at the end in case they influenced each other. Fortunately, they put all the teams in the same order. Robert was complimentary about all the ringing and encouraging and Patricia gave out the results, having first put in a plug for the book stall situated in the back of the car! The church was running a coffee morning and seemed quite pleased for the ringers to tag along and the local band was open-mouthed in the kitchen listening to some esoteric advice from our judges. They seemed to be heartened enough with their efforts to consider entering the eight-bell competition next year. 1st Tilehurst: Jenny Page 1, Eunice Wark 2, Colin Newman (C) 3, Mascot, Anna Sherwood 4, Colin Cairns 5, Tom Sherwood 6. 3rd Mortimer: Penny Wallace 1, Janet Carless 2, Elaine Perkins 3, Peter MacNaughtan (C) 4, Nick Munson 5, Rex Haigh 6. 4th St Mary/St Laurence: Pam Williams-Jones 1, June Saint 2, Louise Ellis 3, Rose Anne Kimber 4, Steve Bennett (C) 5, Jennifer Ellis 6. You may have noticed that the images shown at the top of each page are the three central Reading towers. This is no coincidence. They were all taken within about 15 minutes of each other on a nice clear day last year. Ideally, we would have a photo of every tower in the branch. These would then rotate randomly, ensuring all towers in the branch would get equal positioning at the top of our website. This is where we need your help. 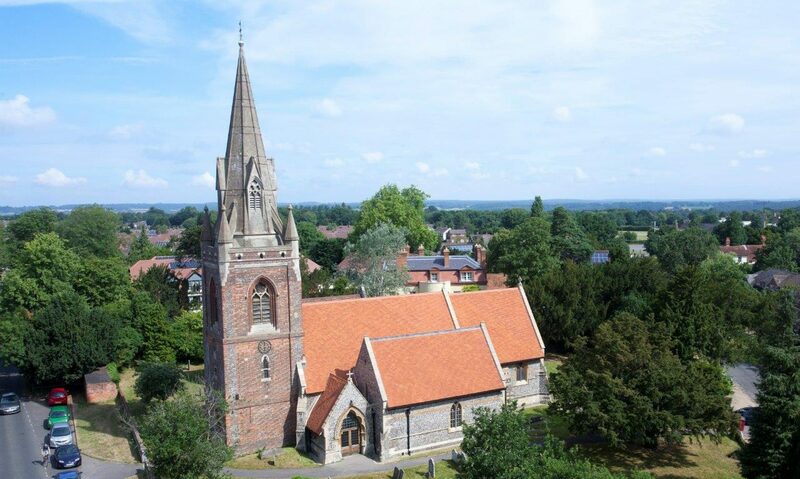 We are looking for colourful (ideally with a blue sky) photos of your local tower to include at the top of the page. Most camera phones are capable of taking photos of sufficient quality, so why not get a quick snap on a Sunday morning and send it in? We look forward to seeing the whole branch represented on our home page! New Trial Run due to popular request. Branch practices cater for all abilities from rounds upwards. All members are most welcome to come along whether you want to consolidate what you have already been ringing or try something new. Branch practices are an opportunity to progress your ringing in a friendly and helpful environment!